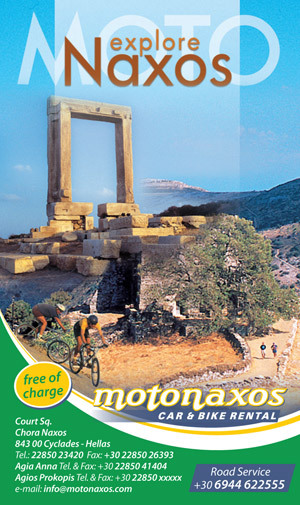 Welcome to Motonaxos.com the biggest online system for car and motorbike rental on Naxos. We offer a wide range of cars for rent in Naxos, new and safe models of motorbikes and quads, the top quality of the hired vehicles , VIP customer service and excellent car & motorbike rental deals. For fast and easy car rental and bike rental in Naxos Island, make your reservation through our online system. before the first rental day for Groups: Cars, Scooters, ATV. For any Cancellation made after, the deposit will be charged. The Rental Company is authorised to cancel the reservation in any case of misstatements, such as driver’s licence and credit card details etc. and is entitled to charge the entire deposit. We guarantee the best available rates and best possible insurance coverage on top quality vehicles with high standard service. Attention: Mentioned rates and offers are valid only for reservations made directly through our homepage. Baby Seats (Have to be pre-booked and confirmed by the rental station). office hours (08.30h – 21.30h). Beside these hours an additional fee is applicable. TAXES: All taxes are included in the basic rates. Payment: The following credit cards are accepted: MasterCard / VISA. For payments made only through our wesbsite, the following cards are accepted: credit cards, debit cards, and prepaid cards from Visa, MasterCard, Maestro, American Express. - Remaining Vehicle rental fees are payable upon receiving. Remaining Vehicle rental fees are payable upon receiving. A deposit is required for all rentals. Credit cards are acceptable. - Minimum age of driver is 23 years for the groups A, B, C, M, F, mini special, E, D and 27 years old for the groups U, K, L.
Driver's licence: The Driver must hold a valid car driver's licence for at least 1 year. Passport or ID card is additionally required. ATTENTION! For some non European Drivers maybe is needed an International Drivers License. For any hesitation you can send us a copy of your license to assist you. Insurances: The following insurances are available. Super Theft Insurance(F.T.W.) with no excess. Personal Accident Insurance (P.A.I.) for the driver. ATTENTION: There is no insurance coverage if the driver is under the influence of alcohol, any kind of drugs or commits any traffic violations. Driver is liable for all parking and traffic violations during the rental period. Absolutely no vehicle is allowed to be driven in sand, on the beach, in dry lakes or off roads. All cars (except suitable jeeps) are only allowed to be driven on paved roads. Please NOTE, that there is no insurance coverage for damages caused to the tires, mirrors, loss keys, underside damage, damage to the gear box. Roof Rack: Is provided, following a reservation, with an extra charge and for specific cartype. Pure car cleaning – allergy free: can be provided with an extra charge. Minimum age of driver is 21 years. Driver's licence: The Driver must hold a valid driver's licence. You are allowed to driver scooter up to 150cc only if it is also valid to your country legislation. For motorcycle is obligated a motorcycle driver license. For atvs and buggy is obligated a car driver license. Third party insurance (3rd.P.I.) for all the vehicles: with 3rd party insurance in case of an accident our insurance company covers the cost of the damage you have caused to another vehicle. Insurance C. D. W.(Collision Damage Waiver) The renter is insured for damages to the rented vehicle in the event of an accident with an excess(arranged it locally). Flat Tires Insurance (F.T.I) flat tire insurance covers reparations and transportation of the vehicle without additional cost. ATTENTION: There is no insurance coverage if the driver is under the influence of alcohol, any kind of drugs. Driver is liable for all parking and traffic violations during the rental period. Absolutely no vehicle is allowed to be driven in sand, on the beach, dry lakes and off roads. Please NOTE, that there is no insurance coverage for damages caused to the tires, mirrors, loss keys, damage to gear box.